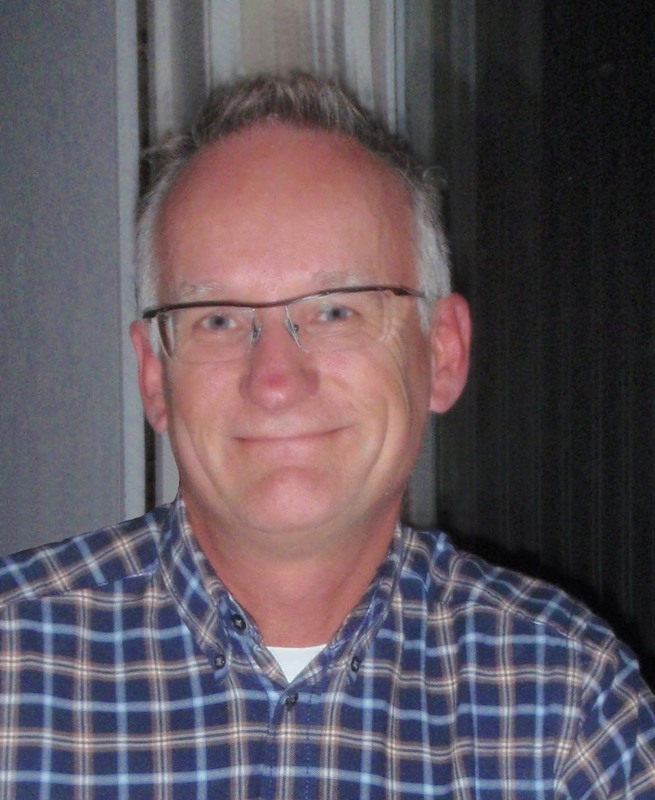 The first jury meeting this year was held August 17. 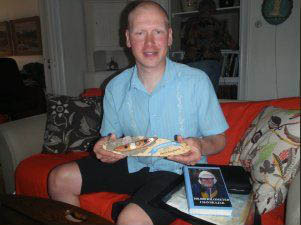 Martin, who lives in Stavanger should come to Stockholm for a christening. 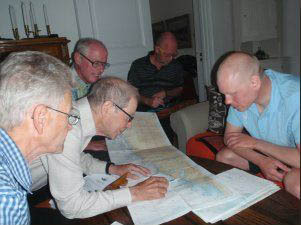 With such along way it is always best trying to co-ordinate as much as possible and Thorvald Nielsen, Sven Berggren, Mats Grindvik and Bengt Larsson were part of the jury together with Jim Danielsson. 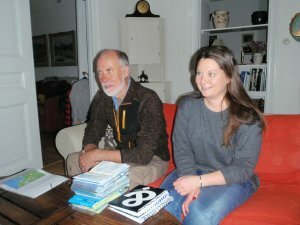 As listeners were also Lennart and Jonas Bergström invited and present. 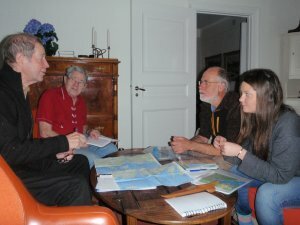 With his good knowledge of the Swedish coast with all its islands was Jim leading the scrutiny of Martin’s track. This was distinctly drawn with all stops for the night clearly marked out ands numbered. This part of the jury meeting was hereby soon made. 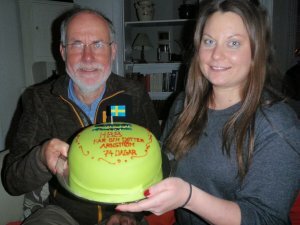 Jim was the first to congratulate Martin to an approved paddling along the entire coast of Sweden and his conquer of HBB. 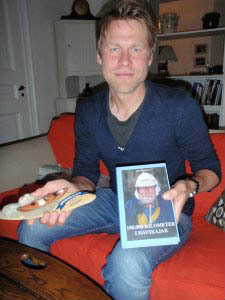 Martin received his miniature kayak and also got Jim's book. All as memory from his tour. 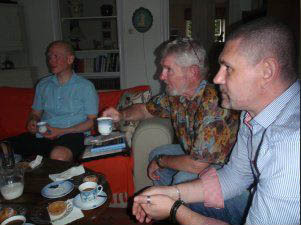 This meeting was later rounded off by beer and sandwiches followed by coffee. 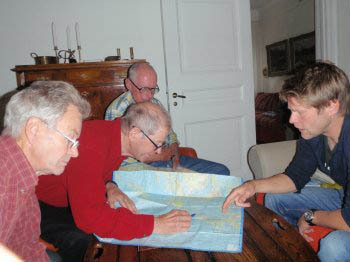 After this photographic presentation of today’s protagonist - Bengt Olsson - the scrutinizing of maps and log-book began. 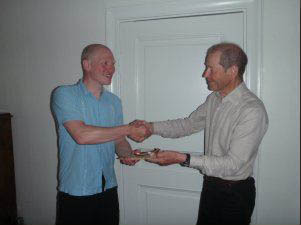 With Jim as chairman assisted by Sven Berggren, Thorvald Nielsen, Bengt Larsson and Curt Ostwald. 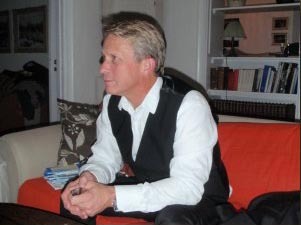 Bengt had all in good order and the meeting could proceed. As the scrutinizing was done and no member of the jury had any objection the meeting could be pushed through. 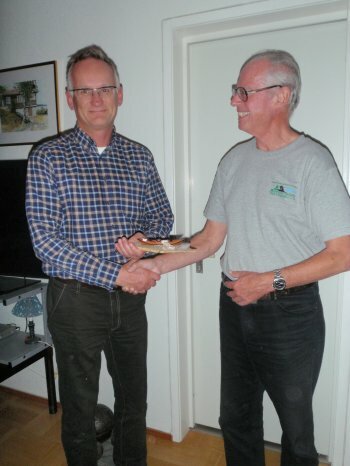 Bengt was now an approved conqueror and could get his miniature kayak from Jim. 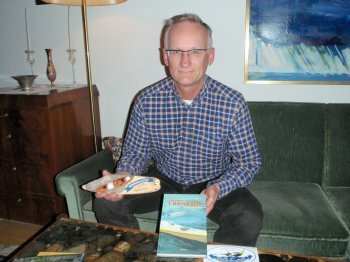 With the proof in his hand and a very readable book in front of himself couldn’t Bengt else than look satisfied and pleased. 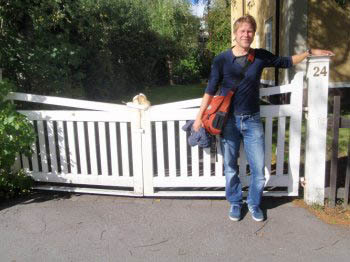 As most of all the others did Ola pass the well-known Gate carrying his luggage and maps and log book before his meeting with the jury. 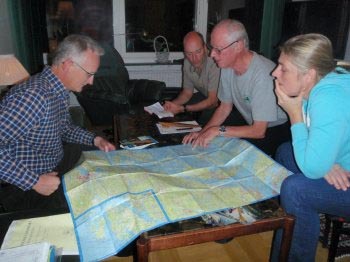 Map by map passed revue on top of the table and soon was the last map reached. 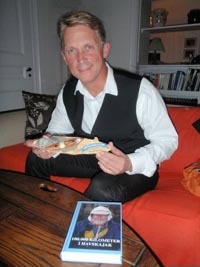 ... followed by receiving his book as well. 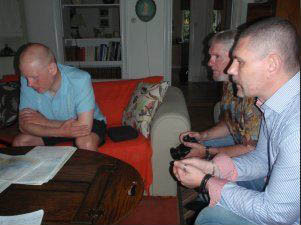 The loyal jury was also this time made up by Bengt Larsson, Thorvald Nielsen, Jim Danielsson and Sven Berggren. 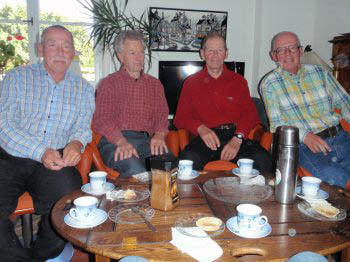 The thoroughly finished table reviles that the ending coffee tasted nice and was at the right time. 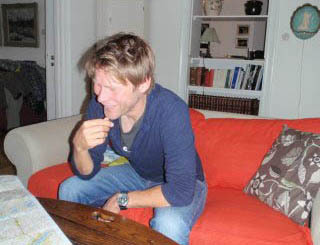 Ola was temporary photographer as Bengt was caught in this photo. 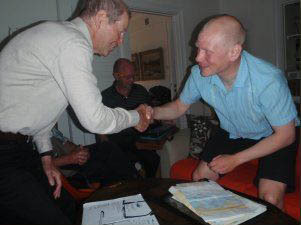 Börje was received by the jury in the home of Svenne for once as Jim sounded like a crow in his bed. Actually was this the first time ever Jim couldn't participate in a jury meeting. 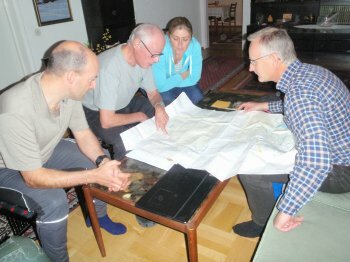 The present members were Magnus Fischer, Sven Berggren as chairman, Louisa Rolandsdotter as well as Bengt Larsson (faithful behind the camera) started to scrutinize log book and maps. 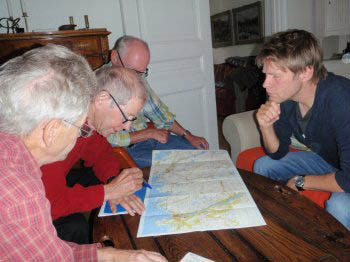 The meeting passed off well without any objection against the drawn route in maps or written words in the log book. 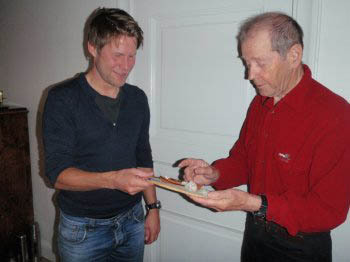 Therefore followed soon the moment when Börje could receive the miniature kayak. 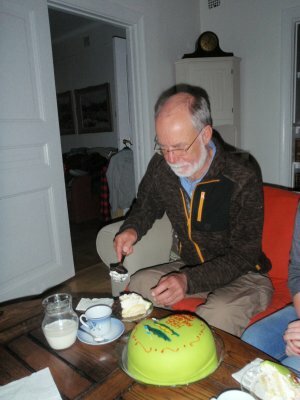 Thereafter followed customary distribution of Jim's book and sticker as memory of this jury meeting after a well realization of his tour that lasted 48 days. 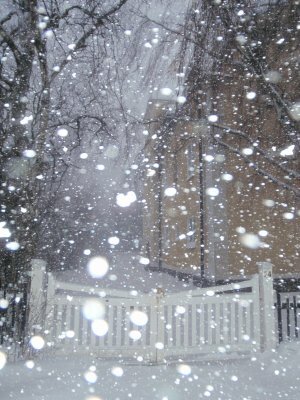 Despite heavy snowfall succeeded all that had managed the traffic problems to find the well-known gate and felt it nice to com indoors. 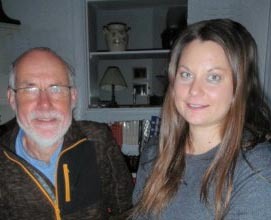 Paul, so far called by his nickname Palle, and his daughter Karin settled themselves expectant. 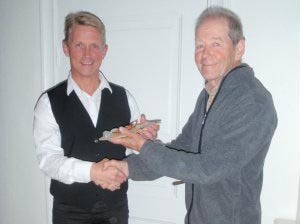 In a decimated jury had Jim good assistance from Curt Oswald and Bengt Larsson. 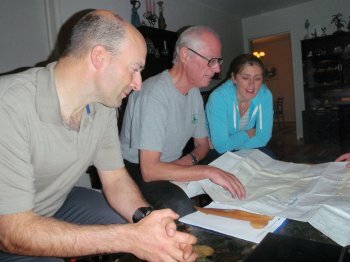 Jim, who is familiar in reading maps entered deeply in the ones the couple had brought forth and could later be satisfied to approve the duo as conquerors of HBB. 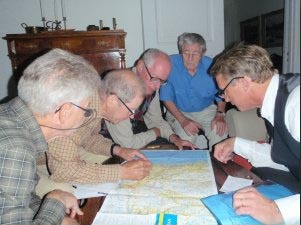 Traffic difficulties put a trace in other ways too into this meeting. 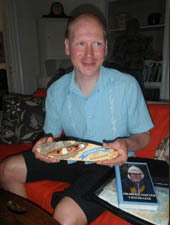 The miniature kayaks that Karin and Paul had whished had not been able to arrive in time, but will be handed over as soon as possible. 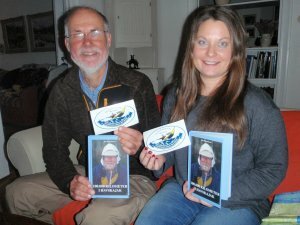 That's why one soon were at the point to receive Jim's book '100.000 KILOMETER I HAVSKAJAK' as well as stickers to decorate the kayaks with. 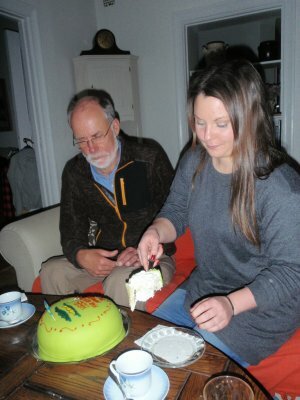 After this came Jim with a welcome and tasty tart which Karin cut a piece for the others. No, sorry! It was a piece for herself. The tart lasted even to the others. Thus were the meetings this year ended. 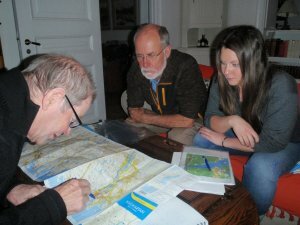 They began in gassing sun with last year's paddler Peter Svanberg mid July and were cold off in inclement winter weather. No matter when, the tune is nice and warm.